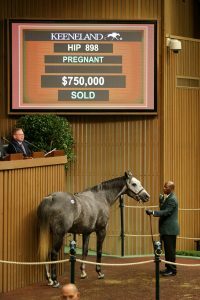 LEXINGTON, Ky. — Miss Exclusive, an Unbridled’s Song mare from a powerhouse Juddmonte Farms family in foal to Noble Mission (GB), sold for $750,000 to Marette Farrell, agent for Greg Goodman’s Mt. Brilliant Farm & Ranch, to headline Wednesday’s third session of the Keeneland November Breeding Stock Sale. Noble Mission is a full brother to Frankel, Juddmonte’s undefeated European champion and leading sire who stands in England. Consigned by ELiTE, Homeland Security also won the River Memories Stakes at Belmont this year. The session’s top-priced weanling is a Tapit colt sold to Solis/Litt for $380,000. Hidden Brook, agent, consigned the colt, who is out of the Candy Ride (ARG) mare Sweet Dreams, a half-sister to Grade 2 winner Strike Charmer (who sold Monday for $700,000 to Marette Farrell, agent for Mt. Brilliant). The colt is from the family of champion Gold Beauty, English Horse of the Year Dayjur, Grade 1 winner Maplejinsky and Grade 2 winner The Prime Minister.